When Matt and I started dating, he said that he wanted to go on a big, massive trip for his 30th birthday. He was thinking Vegas, or even a huge California road trip. I was, of course, totally down with this. But then his 30th year dawned – that’s this year – and we were in the middle of saving for a house. A house sale that is in progress, which is cool, but meant a big American holiday was probably not going to happen this year. I mean… holiday or house? I know what I’d pick. It bothered me though, that my boyfriend was turning 30 and it might just feel like every other birthday. They’ve been fun – cocktails and big dinners and theme parks and burger crawls – but I wanted to TOP them. Vegas was out - as was everywhere else on our long haul bucket list like the Grand Canyon, Thailand and Japan (I've been thinking of that bucket list a lot lately thanks to Royal Vegas' new Around the World in 5 Slots campaign) but I felt a trip was needed. And so I started planning. I started by suggesting that Matt took his Thursday birthday AND the day off after work, blocked out the weekend on our calendar, and hit up the internet. Dublin was a no-brainer, actually. We’d talked about wanting to go before, it was cheap as chips to get there and I knew we could see in Matt’s birthday in style. So I hit up Ryanair and AirBnb with a good three months to go, and attempted to not blurt out the secret to Matt. Meanwhile, we were saving for that house, so affordability was on my mind. Dublin isn’t the cheapest place in the world once you’re there, so whenever a member of our families asked what they could get Matt for his birthday, I asked if they wanted to contribute to the trip. This is SUCH a good idea. Not only did it make the trip more affordable, it also made it more personal. My sister and my parents bought us entry into some of the museums we wanted to see, like Guinness Storehouse and the Irish Whiskey Museum, while Matt’s parents paid for the flights. I tucked their cards and booking confirmations into a new carry-on suitcase that I picked up from Spartoo, along with a Dublin guidebook, wrapped it up and gave it to Matt on his birthday morning. It was great. 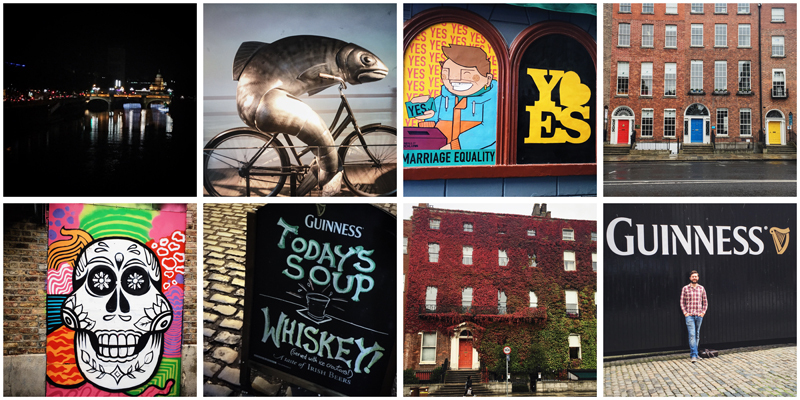 We hopped on a 2pm flight on Thursday and spent the rest of the weekend falling in love with Dublin. It’s a very cool place – totally our scene, as it’s packed with restaurants and bars and loads of things to do and see. My Instagram has never looked so good. Hotels in Dublin are pretty pricey, but I found a good value Airbnb above the Unicorn Restaurant, which was in the heart of the Grafton St area. It was great. A really nice apartment with an incredible location – it couldn’t have been more central. It was a little noisy, but I’d absolutely recommend it for the price and the location. So, everyone said we should go to the Jameson Distillery if we were in Dublin and wanted to learn about whiskey, but unfortunately it was closed while we were there so I booked the Irish Whiskey Museum instead. They do various tours and experiences, and I splashed out on the fanciest one - the Blending Experience which consisted of a guided tour, a tasting of four Irish whiskeys and the chance to blend our own personalised bottle of whiskey, too. I like whiskey okay, but as a rule I like a hearty slug of a non-alcoholic mixer with my spirits, which is blasphemy to a true whiskey fan. Matt was happy though, as he got to drink most of my samples along with his! The museum was actually really interesting, and the blending experience was fun, with four very different whiskeys to try. We also had a naming contest, which I lazily entered with Whiskey McWhiskeyface... and won. I'm sorry, world. Guinness Storehouse The other part of Matt's birthday present! I actually can't stand Guinness (or any beer, in fact) so this was solely for him, but I must admit it was a really good museum. It's huge, and full of interesting facts about making Guinness, and even includes a floor dedicated to their amazing marketing campaigns which was fascinating. They also taught us the correct way to taste Guinness, which I was excited about - maybe I'd been doing it wrong all these years! I had not. Still gross. But a good museum! And the gift shop is great. All Guinness everything, all the time. On Saturday, we had an open day and it was pouring with rain, so inside activities took place. The Natural History Museum was just round the corner from our apartment, and it felt worth a visit. It was just the kind of museum I love - creepy, musty, with the feeling that it hasn't changed in decades. I have a soft spot for the lovely clean, polished museum in London but there's a little more charm to this kind of museum, in my opinion. Full of the joys of taxidermy. We had a wander around the grounds of Dublin Castle, which was very pretty. It's actually free to explore the grounds, although it is quite small. We didn't go inside though, but we did go to an excellent cake place just opposite. It's quite odd going round Trinity College as a tourist during the last weekend of September, as we were tripping over freshers. It's a beautiful campus though, but the highlight is the library. 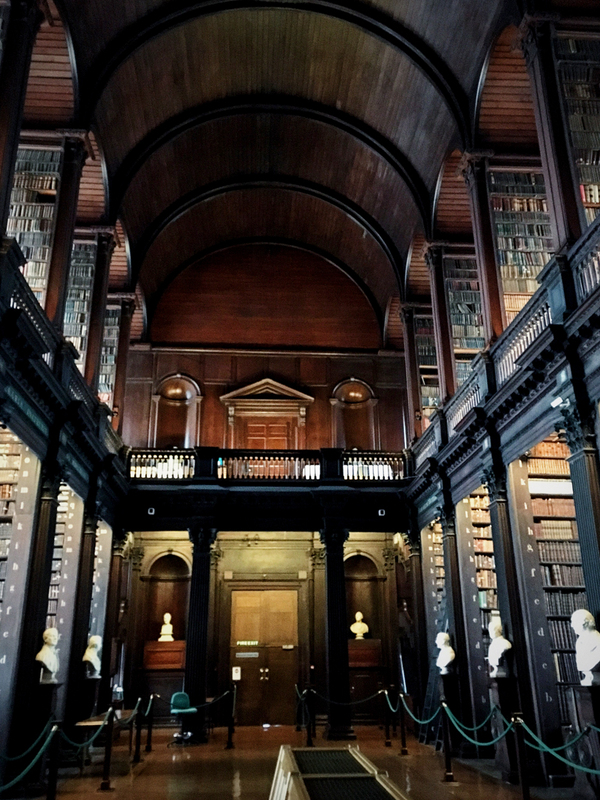 You have to pay to get into the old Trinity Library, but you get to see the Book of Kells too, which is one of the oldest books in the world. The library was the most exciting part to me, though - huge, old, beautiful, packed with books from floor to ceiling. I want to live there. I want one in my house. Sigh. We were staying quite near this beautiful park, and had a couple of pleasant strolls through the park. We even sat there for a bit on our last morning, before we caught our flight home. It felt like a mini Central Park with gorgeous landscaping, rivers and bridges - we even walked through a pretty wedding photoshoot there, too. It doesn't seem like a long, long list but that's because we spent a lot of time eating and drinking, too! But that's a whole 'nother post, because I have a LOT to say about that. Pretty much all good. I would absolutely love to go back to Dublin. We spent most of our time around the Grafton St area, and so I feel there’s a huge chunk that we didn’t see. That said, I was satisfied with what we did see and do – a long weekend was a great amount of time to cram it all in without feeling rushed.